I have a few YA reads and books laying around that I'm getting to in no particular order, as well as a book I am reading through slowly and so I thought I'd just "lump" today. It's random but it's what I've got! 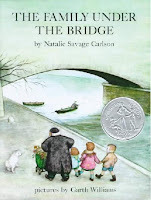 I had heard of The Family Under the Bridge a time or two and then Amy at Hope is in the word reviewed it at the beginning of December. Her review is much better than anything I could probably write up and I see no need to duplicate. If you'd like to find out the storyline of this book, (and learn a fun fact about Amy at the same time!) then go read Amy's review. I found a copy of this at Goodwill for a whopping $0.99 and snatched it up to read on her recommendation. One of the wandering gypsy children are talking to the homeless Calcet children about their very red hair. "Your clothes look so sad," said a gypsy girl, "but you have happy hair." Since my hair was bright red when I was young (and has now turned into a "real handsome auburn") and because my favorite character is Anne, I liked the 'happy hair' remark. I'm quite content to welcome this story into our family home library and I anticipate reading it regularly around Christmas time. It has such a Hallmark-y feel to it. Well, I liked it anyway! Thanks, Amy, for the nudge! 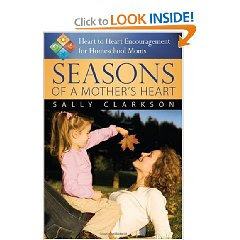 I've read the first three chapters of Seasons of a Mother's Heart as part of a mother's study group. I've read only one other book by Sally Clarkson but recently read her daughter Sarah's book, Read for the Heart. Apparently in the Clarkson case the daughter is following in the mother's footsteps, which is a fun thing to see and experience as I read their books. I have to confess that the thing that just drives me nuts about Seasons is that it is branded as being geared towards home schooling mothers. I'd like to take a dark, black permanent marker and every time she says "home school" I'd just cross it out. Then the book would be relevant for moms everywhere, which I believe it is. (You just have to get past the fact that she's focused on the home schooling mother - but then I know that has huge appeal to, well, home schooling mothers.) I say that, by the way, having every intention of home schooling our own children. It's just too selective for me and I think what she has to share is beneficial to a much wider audience. Unfortunately, many may choose to bypass this book because the branding label that was used on it. You probably shouldn't. ". . . contentedness seems to be an illusive ideal. For many it seems that there is always something out there, just beyond their grasp, that they cannot have but which they believe will fulfill them and make them happy if they could somehow get their hands on it. But they can't, and their failure to do so leaves them feeling anxious, empty, and depleted. And so they live in the shadow of unfulfilled expectations of how their lives could or should be. As a person, I like things manageable and easy. Some of you are probably aware of what I've become aware of in the last four years-ish. Children are unpredictable and do not make for a manageable life. They are constantly changing. Their sleep schedule is always about 1/2 hour off of where you want it to be and they aren't quite as excited about being potty trained as you might otherwise appreciate (and sometimes, if the prize is right, they are TOO eager to be potty trained and you end up in the bathroom for hours on end in hopeful anticipation!). It's easy for me to think ahead to when they don't need my constant attention and I feel moderately ok about the idea of wearing white clothing items again. It was just the other day that I actually felt the first pang in my heart that told me that they wouldn't be this age forever. This time in life is fleeting and meant to be enjoyed. Even when the diapers refuse to be filled with anything but poop and the mere idea of nap time reduces us to a puddle of tears (his, not mine). I'm working on enjoying the little moments, the dirty moments, the sad moments and the ecstatically happy ones and being content in the "springtime" of motherhood. On the subject of parenting, I also read and wrote a review of Gospel-Powered Parenting over at 5 Minutes for Books. If you missed it, you'll have to travel over there to see it. I enjoyed the book very much. Jonathan and I both read it. I would say that there was nothing earth shattering about the book and at the same time, there is everything earth shattering about it. Lastly, and on a different note, I recently read through and reviewed Brainiac's Secret Agent Activity Book as part of the Children's Classics Mystery Challenge over at 5 Minutes for Books. A more awesome book for wanna-be detectives I think you'd be hard pressed to find. At any rate, I'm reliving my childhood to some extend and we have a giveaway copy of the book. 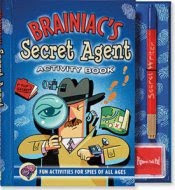 To read my review of Brainiac's Secret Agent Activity book and to win a copy, visit 5 Minutes for Books. Thanks for the nod, Carrie! I didn't know your hair is a "handsome auburn" now! (Not that I didn't think it's handsome, just that I didn't know it's auburn--awww, you know what I mean!) In pictures I always assumed it looked brown, like mine, only lighter. The things we learn. . . Thanks for your comment on my Friday Faves, Carrie. I was reading down your blog and see that you were reading Cherry Ames. I loved those books when I was a little girl, and I think the ones I read were really my mom's from her childhood! Cool, huh? She would be 76 if she were still alive. Thanks for bringing back that memory.